Yes, Age of Ultron’s inspiration is obvious. On the surface it’s an Age of Apocalypse for the Avengers, a dystopian alternate future where a major franchise villain has taken over the world and driven its heroes into hiding. The fact that Ultron is the main bad guy in Marvel’s first big event of the year underscores how thoroughly the Avengers have supplanted the X-Men as Marvel’s most popular family. It’s like a balance has been restored to the relationship between the Marvel Universe and the real world—the biggest heroes within Marvel’s fiction are once again the biggest heroes with Marvel’s audience. I’m cool with that. I find more value in the traditional heroic ideals of the Avengers than in the X-Men’s mealy metaphors for intolerance. It takes an especially gifted writer to make the X-Men truly work, and although the franchise is humming along nicely at the moment, smart writing is a quality that X-Men comics have largely lacked for the last twenty-odd years. It’s easier to write a passably good Avengers comic, and that’s almost what Age of Ultron #1 is. 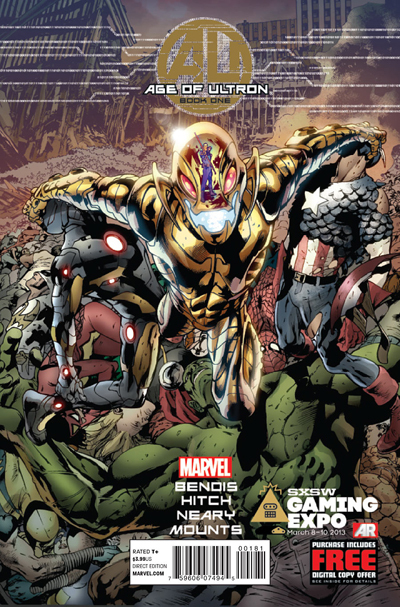 The biggest problem facing Age of Ultron #1 is the inescapable reality of the comic book market in 2013. One issue is four dollars for two scenes and maybe ten minutes of a story that won’t be completed for months. This is a Bendis and Hitch production, so that means it’s wordy and intricately drawn but also sparse in plot. Its moments are thoroughly explored but there aren’t nearly enough of them to satisfy. (There’s also a weird and annoying two-page blur effect that’s either a misguided attempt at immersion or proof that my comiXology download somehow got screwed up. Damn Chipotle Wi-Fi). Again, there’s nothing wrong with what’s here. Bendis reins in his more annoying tics, with dialogue that isn’t as mannered or interchangeable as his critics often accuse him of writing. Hitch’s detailed work can be a bit confusing from an action perspective, but he creates vividly distressed impressions of a destroyed Manhattan. Ultron is a convincing world-beater, and the type of serious A-list threat that isn’t quite as overexposed as Marvel’s more famous villains. I could generally do without any more alternate dystopian futures in my superhero comics, but at least this book seems to focus on a different cast of characters than most of Marvel’s similarly-themed stories. And it’s heartening to see the humanistic side of Hawkeye (which is so excellently explored in Matt Fraction’s current Hawkeye series) take a leading role in a major Marvel event. This is a character that should easily be one of Marvel’s most relatable and likable, and it’s satisfying to see the company capitalize on that potential after a decade of neglect. And all that’s done in under fifteen minutes. It took almost as long to download on that weak fast food Wi-Fi as it did for me to read. Even Ultron’s short length would be fine if the story felt like a full experience, a full chapter in a longer tale, and not just the first scene of the first act. Instead, it’s a fight scene and then a brief glimpse at the heroes’ harried underground existence. Instead of being intrigued for the next issue, I’m just sort of frustrated.